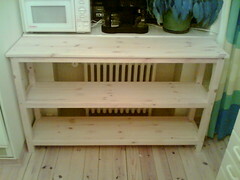 This weekend I built the kitchen table (the plan for which is here). It still needs to be painted with a dark brown wax, to give a “hardwood” look and fit in with the other kitchen furniture. It’s been very satisfying to work on the table, but also very hard work. I’m glad it’s done, and it turned out quite OK – the mistakes I made aren’t really visible! 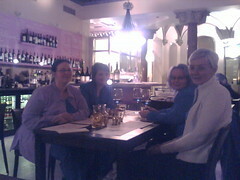 I’m with Eve & her friends Riikka, Marita & Sari in Via, a very stylish wine bar in the centre of Helsinki. 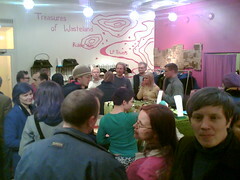 On Wednesday evening Eve & I joined Isabella, Marko et al at the Secco shop opening party. Secco specializes in products made with recycled materials – their motto is "The Treasures of Wasteland". Their new shop is at Fredrikinkatu 33, right in the centre of Helsinki’s trendy boutique district. There were lots of interesting people, including a few familiar faces. 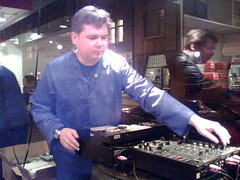 Marko was in charge of the DJ’ing, and seemed to enjoy the attention. And of course there were the fascinating Secco products. 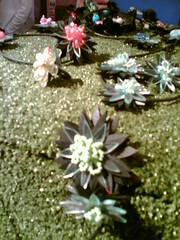 This ‘Wasteland Garden" jewelry, designed by Anja Hult, is made of black tyre rubber and coloured beads. 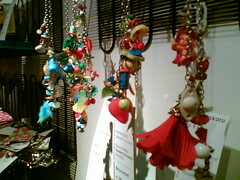 This colourful jewelry is made from lots of small odds & ends, strung on a chain. 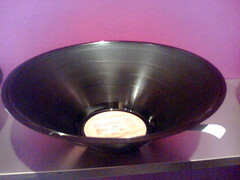 I especially like these bowls made from old vinyl records. 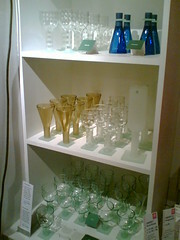 And these glasses and candlesticks made from old wine bottles are fun. The patterns on the glasses are etched, so they’ll withstand dishwashers. Last year I promised Eve that I’d make a table to go under our kitchen window. 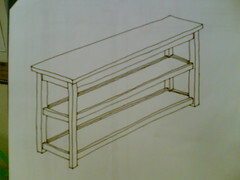 I’ve had the plan since last summer (though originally it had slatted shelves); my problem has been to get the necessary wood. I’ve visited our local timber yard many times, but each time they’ve been out of the wood I need or their big circular saw has been out of order. 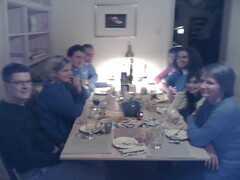 We’re sitting around chatting at the end of our Shrove Tuesday pancake party.